Perhaps I shred all creditability, or perhaps I'm better placed than most to comment on The Hangover 2 from having just watched the original for the first time - and largely enjoyed it, I won't lie - only 12 hours previously, either way the sequel most people probably didn't ask for has arrived relatively under the radar. Last we saw Phil (Bradley Cooper), Stu (Ed Helms) and Alan (Zach Galifianakis) they were hurrying around Las Vegas trying to piece together their colossal stag do from the night before, in search for their best chum, Doug (Justin Bartha) with hours to go before his wedding. Though the setting has moved to Bangkok, the jokes and situations they find themselves in are still very much the same. Two years have passed since the "Wolf Pack's" escapades in Las Vegas, and Stu having divorced his original wife and not bothering to hook up with Heather Graham from the first film, has finally settled down with the beautiful Lauren (Jamie Chung) and is to be married in her home country, Thailand. Though opting for a low key pre-wedding brunch with the guys, yet again they find themselves waking up with no recollection of the night before, this time on the search for Lauren's younger brother, Teddy (Mason Lee). Like most Hollywood explorations of a foreign culture, The Hangover 2 does largely bow to all the racial stereotypes you would expect from three American buffoons making idiots of themselves in Bangkok. However I do believe a lot of the film borrows from the same situations of the first film. To be honest, whether or not the chain smoking, drug pedalling monkey, transsexual prostitutes, all night tattooist or Russian gangsters were situated in Thailand or Las Vegas is largely irrelevant as if you're a huge fan of the first film there's plenty to love here. As with the first instalment, the performances were actually quite enjoyable. 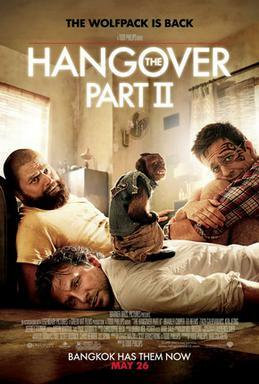 I got the impression there was a lot of focus on, Ed Helm's character, Stu's domestic woes in the original Hangover, so it felt only logical he should take centre stage for the sequel. Bradley Cooper and Zack Galifianakis were on fine comedy form supporting him every step of the way, both putting their bodies on the line in various outrageous circumstances. It was surprising to see Ken Jeong get more screen-time but he took top prizes for some of the film's best moments. The biggest disappointment was yet again underusing, Justin Bartha's role, considering he had to sit out all the madness in the original film. It would have given the writers amble opportunity to have essentially a new character experience all the hysteria for the first time and could have delivered some refreshing results. Paul Giamatti's small role added some extra class to a generally classless film, which yet again insisted on having Mike Tyson make an appearance, this time torturing the audience with an inexplicable musical performance. Seriously. In fairness to Todd Phillips, I do feel his techniques and visual style has vastly improved since the original film, even if the story and concept of this sequel is a demonstration in typical Hollywood mediocrity. Though I suppose no one goes to these types of films looking for genre breaking, Oscar worthy deliveries. If you're part of a large group of people, going to the cinema for some light hearted entertainment, then The Hangover 2 will indeed give you that, just. The Hangover Part 2 is in cinemas everywhere now.